My Meyer Lemon Cheesecake is as delicious as the memories that helped create it. I remember the first time I had mascarpone, Mama Jeanette had made a cheesecake for dessert, it was a blend of ricotta and mascarpone, a different type of cheesecake than I had been used to and my introduction to that wonderful cheese. I kept calling it mars-capone, and Mama Jeanette would laugh and say “Sonny boy, just because the moon is made of green cheese don’t think that Mars is made of mascarpone ” , she would laugh and tell me what a silly boy I was. So many things remind me of the days I spent under Mama Jeanette’s tutelage and so many foods take me back to those times. Food can trigger so many memories, just like a song, it can magically transport you to another place and time. 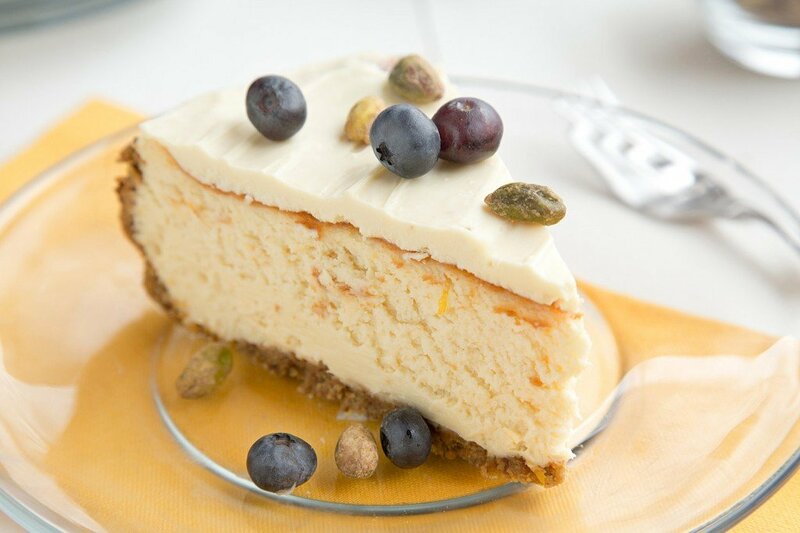 I’ve found many uses for that creamy version of Italian cream cheese that Mama Jeanette shared with me, but cheesecake has got to be my favorite way to showcase that glorious cheese. My wife loves cheesecake, but after two pieces she’ll leave the rest for me…..sigh, thank goodness for neighbors! I do enjoy a good cheesecake and although I do like ricotta cheesecakes, my favorite will always be New York style. Of course, I did take some liberties with the ingredients in my version using half mascarpone instead of all cream cheese. I kept thinking about a sour cream topping for my cheesecake and even had some Lemon Greek Yogurt that would have worked nicely in the topping, but I decided a layer of white chocolate would add just the right touch to my Meyer Lemon Cheesecake. My crust included salted toasted pistachios so when I served my cheesecake, along with the fresh blueberries I added a few of pistachios. What a nice combination of flavors! If you like lemon, this version of my cheesecake should be on your must make list, and when you do make it I hope you enjoy it as much as Lisa and I did. Press crumb mixture into the bottom and sides of a 10 inch springform pan. In the bowl of a stand mixer, beat the cheeses, sugar, lemon juice, zest and vanilla until smooth. Add eggs one at a time, beat on low speed just until combined. Wrap filled springform pan with foil around bottom and part way up the sides, then place the pan into a roasting pan big enough to hold it adding water until it comes up halfway on the springform pan. Bake at 325° for 60-70 minutes or until center is just set and top begins to brown. Remove springform pan from the oven, and cool on a wire rack for 10 minutes. Carefully run a knife around the edge of pan to loosen; cool 1 hour longer then refrigerate at least 6 hours or overnight. Place a stainless steel bowl over a pot of simmering water and melt white chocolate, making sure not to allow any water to get into the chocolate. Make sure heat does not get too high or it will burn the chocolate. 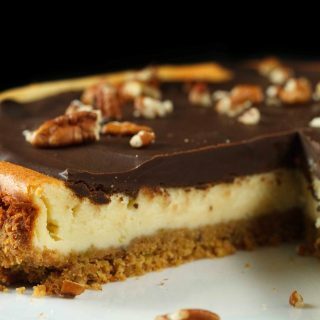 Allow chocolate to cool for about 10 minutes then spread evenly over the top of the cheesecake. Place back into refrigeration until chocolate sets up, about 30 minutes. Spring is finally here and there’s something about lemon that says sunshine to me. I hope it adds a little sunshine to your life today. If white chocolate is melted with cream before getting added as top layer, then will it remain soft for cutting? As long as it’s at room temperature when you cut it, you will be okay. It does tend to get hard. Thank you for your advice on the white chocolate topping. I make a similar cheesecake with white chocolate topping, but the topping is always too hard. Is there a reason you don’t suggest using the heavy cream with the white chocolate? I made this today for Easter. It was delicious! The marscapone added a rich, silky texture and the cheesecake was light. I think it would be great with regular lemons as well.. When melting the white chocolate, I added 1Tablespoon water and 1tablespoon amaretto. 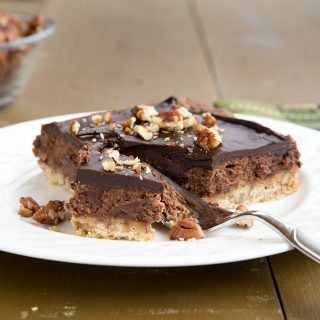 It made the chocolate softer so that it cuts nicely and gives a little almond flavor…it worked out great! Thanks for the feedback Shannon, and I’m very happy to hear that you enjoyed the cheesecake! Happy Easter! I’ve never heard of digestive biscuits, can I use lorna doons crused cookies for the crust. hi Jackie, you can use any type of cookie, a digestive is like a graham cracker for adults. This looks incredible! 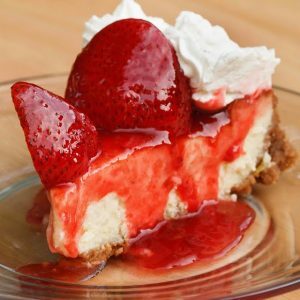 I have been wanting the perfect cheesecake recipe to try out as my husband and I LOVE cheesecake. 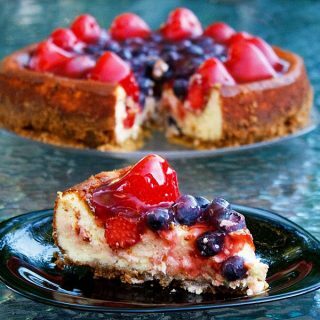 My MIL makes the best cheesecake ever, but I am determined to make one at least as good, and this maybe it! Even better, my lactose intolerant, allergic to dark and milk chocolate, husband can eat this as he can eat white chocolate and cheese! Thanks Ruth, It is a very good cheesecake, the only problem I had was with the white chocolate topping, after being refrigerated it got too hard to cut, so keep that in mind if you do make it. That looks heavenly Dennis – lemony cheesecake is the best! thank you Donalyn, it was too good!! I on the New York Style Cheesecake team as well. This recipe looks divine. I love the pistachios in the crust. Genius. Oh how I love cheesecake and I have always though that cheesecake that has lemon in it is the absolute best. It adds such a nice freshness! thanks Raven! lemon does seem to do so much for cheesecakes, and it seemed like the perfect way to celebrate spring! Thank you, it really was so creamy and delightful! I still spell it like I say it, but after getting notes from some of my Italian friends about my misspelling, I keep rechecking to make sure I spell it right. Oh this will be great for Easter! I always make some kind of cheesecake for the family dessert. 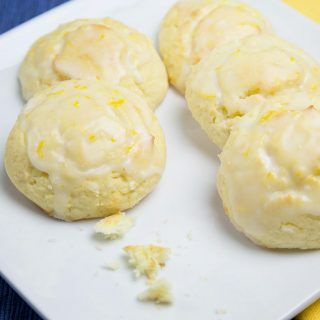 And with Meyer lemons – my sons will flip! Thanks for sharing, Chef Dennis! Have a great Easter holiday! 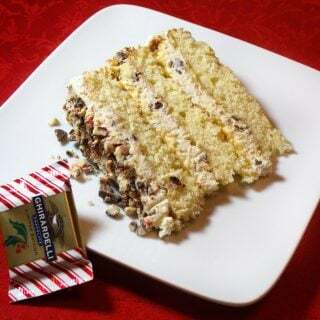 it really was a nice alternative to over sweetened cheesecakes Betty Ann, and the mascarpone made it even creamier! Looks amazing!! I like the match lemon+mascarpone, is one of my favourites for cheesecake. I need to try the chocolate topping! I could hug you. Everything about this says it was made for me (a girl can dream, right?). I love New York-style cheesecake. I love white chocolate and I love citrus. I love my cheesecake without a lot of frills and adornments. This is perfect. It’s beautiful. I’ll be right over. I wish we were close enough, I would have gladly shared my cheesecake with you! I’ll take you up on that hug when we finally do get to meet in person! 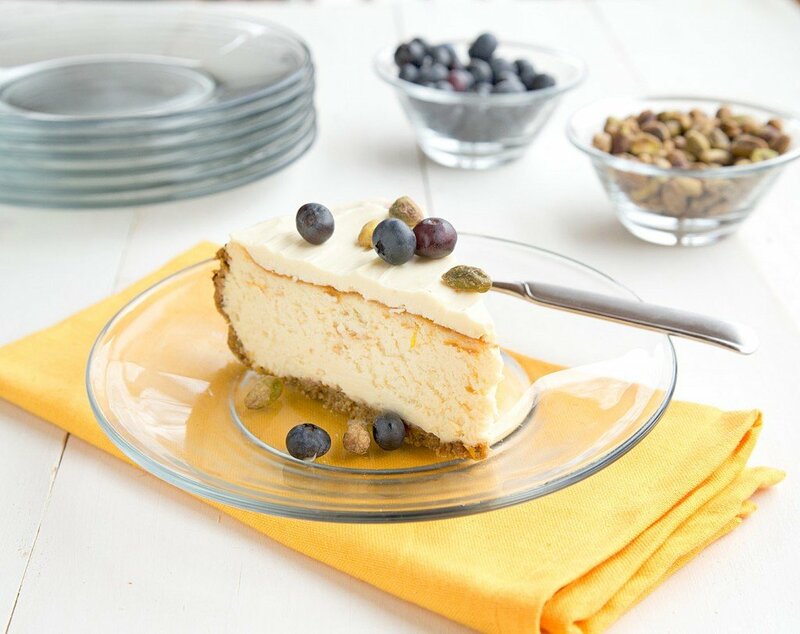 Meyer lemons and mascarpone sound like a perfect match for cheesecake! Thank you Laura, they did go so well together! This combination of flavors is amazing!!! Love it! Thanks Julia, happy to hear you like my cheesecake! Oh wow Chef! This is incredible! Mr.SweetButter would swoon over this, which would make baking this all the more worth it to see. It was a beautiful cheesecake, thanks Tara! Sometimes simplicity is best, and that light layer of chocolate was just enough to dress it up! You don’t have to convince me…this just went on my must-make list! Also, I’ve been saying mascarpone incorrectly, apparently. 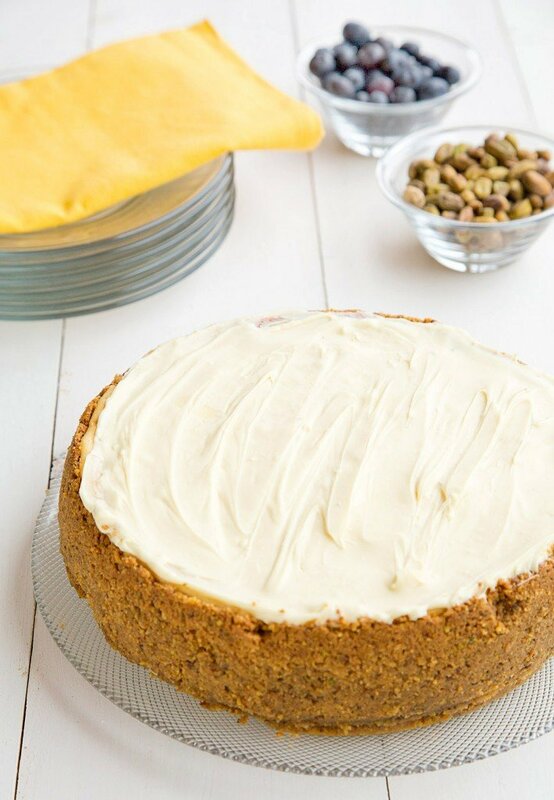 You’re going to love this cheesecake! Do you have any idea what cheesecake does to me? It makes me go bonkers… in the best possible way. A slice and I’m in heaven. This looks absolutely marvelous, my friend. Thanks Brian! Cheesecake is a little slice of heaven, and the Meyer Lemon added such a nice flavor. I have a child who is allergic to nuts. Are pistachios considered nuts? If so, can I just do the crust with butter without the nuts?